A Reman engine part is an original manufacturer part that has completely disassembled, cleaned, had any worn or damaged parts replaced, and tested to extremely stringent standards by the manufacturer’s technicians. Costs 25 to 40 percent less than a new part. One-year, unlimited hours warranty that includes parts and labour when installed by an authorized dealer. Remanufactured at an ISO 9002 certified facility. Any part not meeting new specifications is replaced with one that does. Parts include all the latest factory updates and design changes for maximum performance. Creates an environmental benefit by taking parts that were once disposable and reuses them. 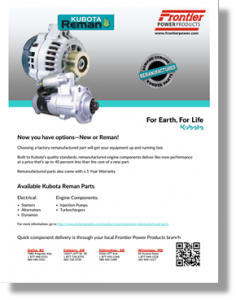 We sell Reman engine parts from John Deere and Kubota. 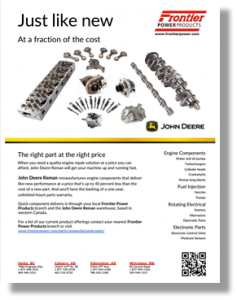 John Deere carries the following Reman parts. For more information on each of the above parts, see John Deere Reman Parts and Components. Another benefit of buying from John Deere is that many of John Deere parts are remanufactured at John Deere’s Edmonton Reman facility (see above video). Each part is completely disassembled. Part components are thoroughly cleaned by a variety of methods including pressure washing, baking, and chemical cleaning. All major parts are inspected for cracks using magnetic particle inspection that detects even the smallest cracks. Any part not meeting original factory specifications is replaced with a new part or brought back to specification by various John Deere approved remanufacturing processes. All wear parts, such as pistons, liners, bushings, bearings, gaskets, and O-rings, are replaced 100 percent of the time with new John Deere parts. The part is assembled using the same assembly processes that were used when it was built new. Call our Parts department with your 13-digit engine serial number to obtain the correct component for your engine or to discuss John Deere’s reman parts. 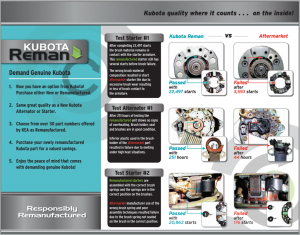 Kubota carries the following Reman parts. 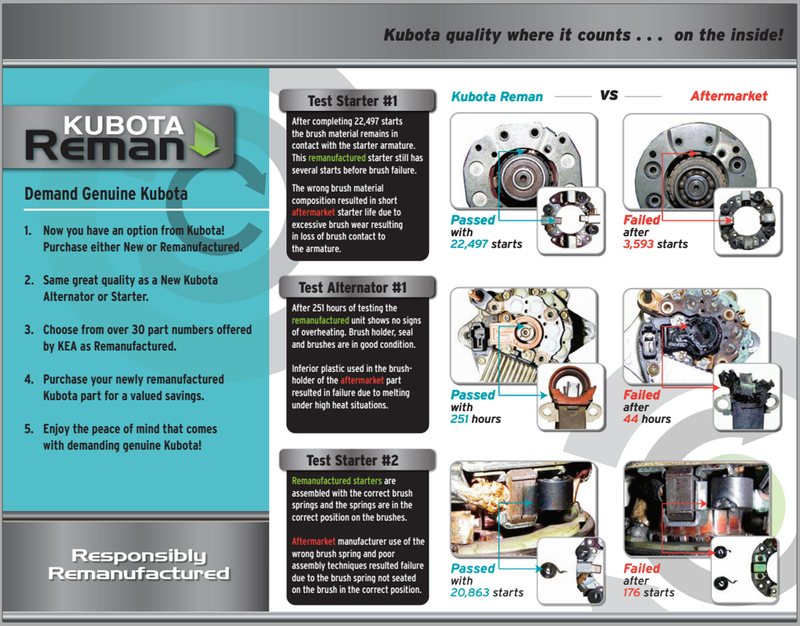 For information, including specific part numbers, see Kubota Genuine Remanufactured Parts. Call our Parts department with your 6 or 7 digit Kubota engine serial number to obtain the correct component for your engine or to discuss Kubota Reman parts.